2007 PGA Championship Southern Hills official embroidered golf pin flag autographed in black marker by champion Tiger Woods, professionally mounted and double matted, and framed with glass and white wood, ready to hang. The framed size is 21 1/2 by 27 1/2 inches. Authenticated by UDA's patented five-step process including matching numbered holograms on the flag and certificate of authenticity. 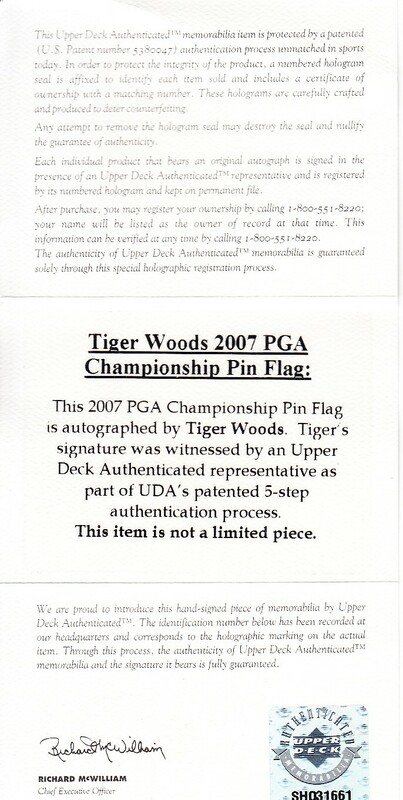 UDA has an EXCLUSIVE autographed memorabilia contract with Tiger Woods, who normally would never sign this flag.